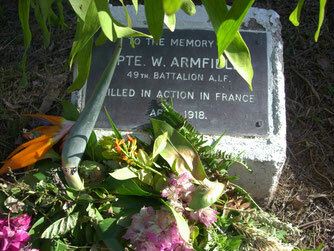 William Henry Armfield was one of 10 children born to John Armfield and Eliza Wright in Mittagong NSW. At the time of his enlistment age 21 William was working in Eumundi for Patrick Donnelly a major builder of the area and William was engaged to Patrick's daughter Cicely. On 19 September 1916 William Armfield embarked from Brisbane on the HMAT A49 Seang Choon arriving in England 9 December. 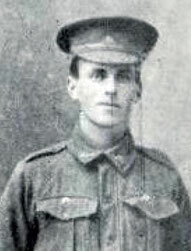 William’s first experience of combat occurred 18 months after he signed up, in the Western Front trenches of Westhoek Ridge in September 1917. On 5 April 1918 Private Allen was killed in action in France with no known grave he is remembered for his service at the Villers-Bretonneoux Memorial France and with a memorial tree in Eumundi Queensland.